Yesterday on my trip to town, i picked up some maple taps. here is what they look like. The hook will hold the jugs where the sap will be collected. 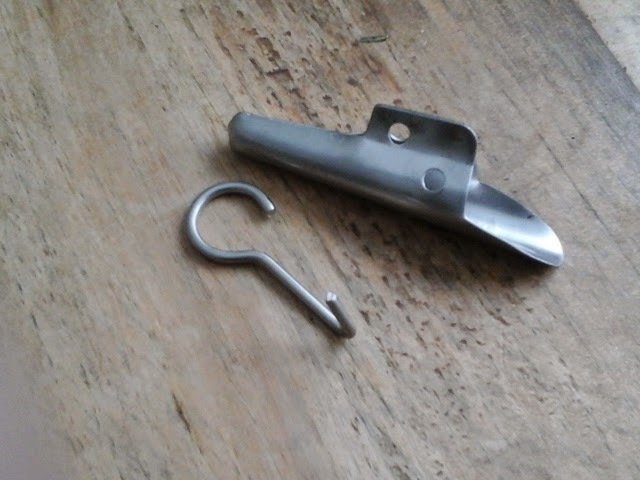 The small end of the tap goes into tree, and the spout will direct the sap flow into our container. TRIVIA QUESTION:Does anyine know how many gallons of sap it takes to make one gallon of syrup? Hint:probably way more than you think! I saw these on my trip down to the chicken coop. There were quite a few of them. I liked this set because it looked like they were practicing sychronized walking. 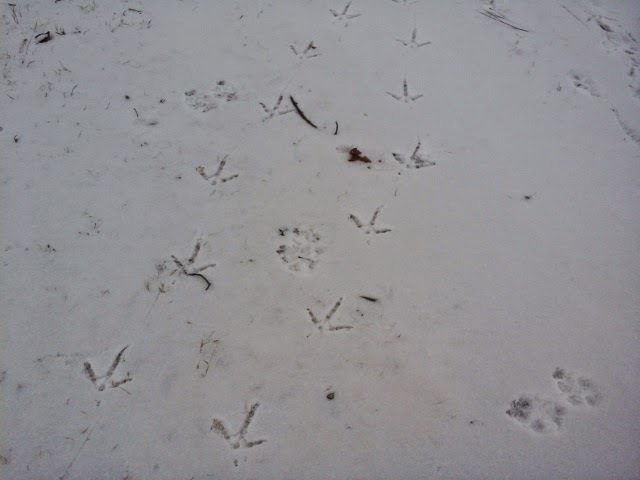 For scale, those are dog tracks from our 100 pound mutt. 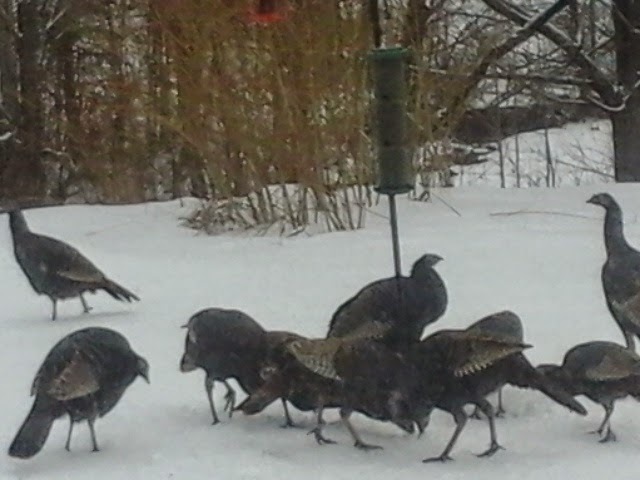 Here they are, checking out the birdfeeder. I am sitting at the kitchen table with the camera. My son says this is the coolest hunting spot ever. Of course, we personally dont eat meat, but it would sure be easy. 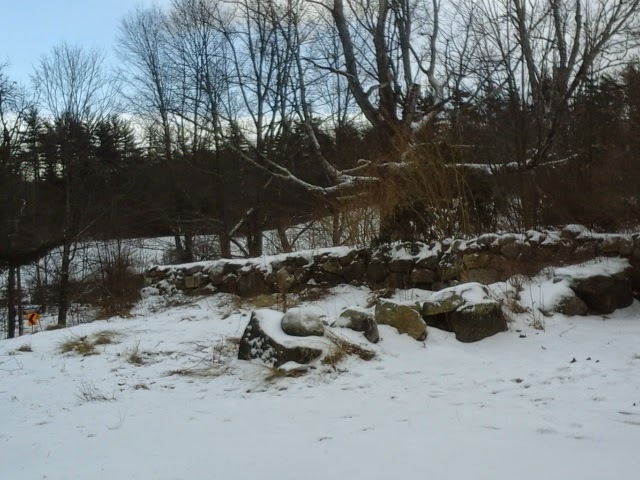 I love the look of this old maple and the stone walls covered in snow. Ancient walls, ancient tree. It is cold and blustery out there. 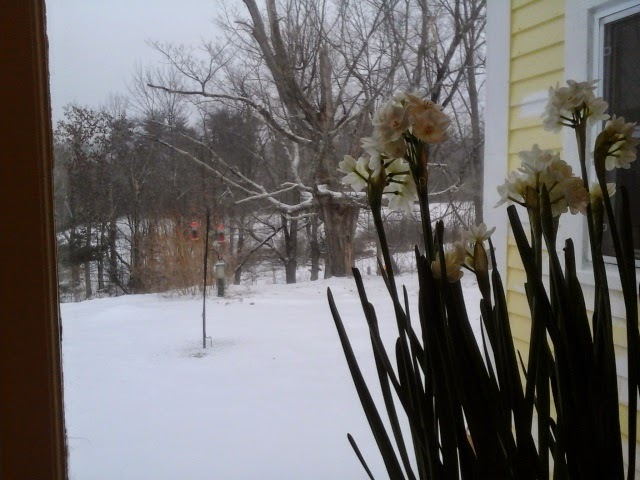 These paperwhites blooming in the windowsill are my little bit of spring amidst the dreary winter.. Instead of any major farm chores today, i started a painting. 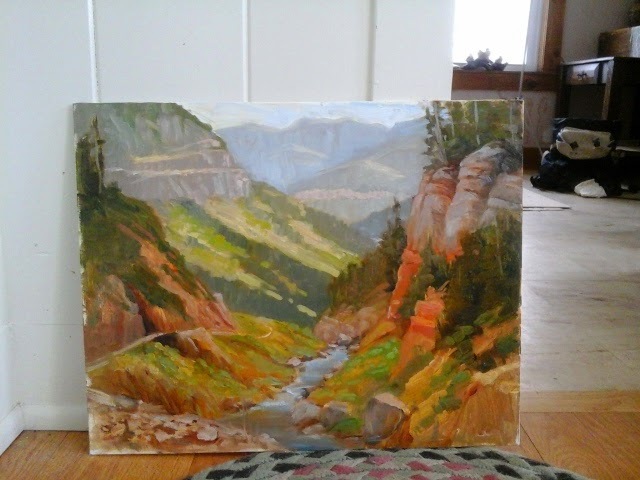 i dont often show works at this very early stage. This is just the start, folks. Dont judge it too harshly yet. When its finished you can criticize all you want. 😊 Some of you reading this might be familiar with the Hardrock 100 Endurance Run. Each year, a piece of artwork or photo is selected to be the finisher's print for the run. The deadline for submission is two days from now. I started today. It might not get finished in time. And i might decide i dont like it.. We will see what happens. And, by the way, Hardrock is what I am training for. Weather today: 0 degrees this morning. 13 now. I bet it gets down below zero tonight. Wildlife: didnt you see those turkeys? Run: ( i should re-name thjs "training" as some days are planned to be strength work instead of a run. Today is upper body and core work. Planks, gotta love 'em. Thought for the day. We dont control the weather! God does! He sends His command to the earth. His word runs swiftly. He spreads the snow like wool, and scatters the frost like ashes. Who can withstand His icy blast?